I am very lovable and I want ALL of your attention. I will seek you out wherever you are - particularly if I think you`re cooking something or there`s food around. I will eat just about anything you give me, even broccoli! I just try to get all the food I can get in one shot. I was recently on the kitchen counter and attacked a loaf of bread! Last night, was my first encounter with a shower. I am a very busy bird and I need something to do at all times to keep me from fussing with my feathers. I am quite compulsive about preening, but won`t let go of my wiffle golf ball while I check my feathers. As mentioned below, my lungs work just fine too! I`m even ok with the vacuum as long as it doesn`t come around unexpectedly. Jenny! That`s me. (I was "Oompah" but that`s not really a good name for a cute cockatoo like me). Mickaboo is taking applications, so you better be quick as I`ll probably be adopted quickly! I am a lovely little Goffins cockatoo recently surrendered to a shelter. 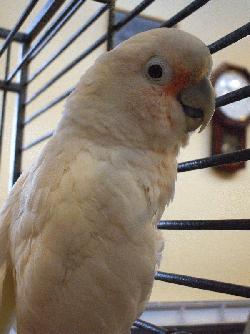 I`m a bit plucked but hey, I was living in a small cage with another bird - a conure named Alice. what do you expect? The shelter staff say I am just a doll. I wanted nothing more than to get head scritches until the end of the universe when I was there. I love attention and to sit on shoulders. . . . the whole nine yards! You probably already know this, but goffins are wonderful companions. We are one of the smartest of all the cockatoos and we have very gentle dispositions. The catch is, though, we can be very loud - especially if we desire attention. The shelter told on me, saying I definitely have got cockatoo lungs. Be sure you, and all the members of your family can tolerate this before you want adopt me. If you think you`d like to have a high energy, agile, charming and wonderful companion cockatoo, then that would be me! Contact the cockatoo coordinator to help get us together. Hope to see you soon!